SAW violin student, Wentong Zhang, will be the featured soloist in the UWM Symphony concert this Friday, February 15 at 7:30 p.m. in the Helen Bader Concert Hall at the Zelazo Center for the Performing Arts. As the winner of the orchestra’s recent Young Artist Competition, Wentong will perform the Saint-Saëns Violin Concerto No. 3 with the orchestra. The program, entitled, Beautiful Scandinavia, will also feature Grieg’s Holberg Suite and Peer Gynt Suite, as well as Finlandia by Sibelius.Tickets are FREE for students under 18; $12 for adults. The box office is located on the lower level of the Zelazo Center. 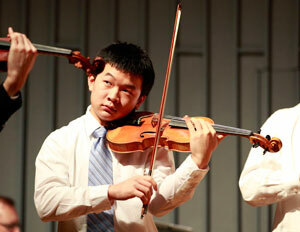 Wentong Zhang, a junior at Whitefish Bay High School, began playing the violin at the age of five. He has studied with Darcy Drexler at the String Academy of Wisconsin since the age of seven and currently plays in the Violin Virtuosi there. He has received numerous awards from the Wisconsin School Music Association’s Solo & Ensemble Music Festivals, performing both as a soloist and a chamber musician. He has also been a member of the Milwaukee Youth Symphony Orchestra as well as the State Honors Orchestra. This past summer, Wentong was selected to participate in the National Symphony Orchestra Summer Music Institute, where he played on the Kennedy Center concert hall stage in multiple performances. In addition to playing violin, Wentong enjoys tennis as well as mathematics, and he hopes to become a mathematician in the future.